The origins of chocolate: Chef Jordi Roca durin his trip to South America to learn about cocoa production. Archive. Jordi Roca, the much celebrated young dessert chef from the Celler de Can Roca restaurant and considered the best pastry chef in the world in 2014, has had something on his mind for a long while. After opening the Rocambolesc ice cream shop and establishing it – a creative project with his partner, Alejandra Rivas – he set himself a new challenge: to make a journey to South America to discover the origins of chocolate and then use the knowledge he gleaned to try to make the best cacao in the world. An ambitious project, which will be turned into a documentary by National Geographic, and a book, which will coincide with the opening of the much-anticipated Casa Cacao (Cocoa House), a chocolate workshop, tasting space and boutique hotel, with Damian Allsop on the team – another key name in the craft of chocolate making – and which will be managed by Anna Payet, Joan Roca’s wife. As Jordi Roca explained not long ago in an interview in El Punt Avui newspaper, everything started with a question: “Can we be chocolate manufacturers?” as well as others, such as “How do you technically make chocolate before consuming it?” and “Where is it grown?” The chef had to find the answers by going into the deepest parts of the Amazon and Colombian jungles. As he confesses in his book, he had never set foot on a cocoa plantation, nor seen cacao produced in a factory, nor seen a fermentation plant, or put his whole arm up to his elbow into a vat to have it impregnated by the acid and rough aroma of the beans in full process of transformation. He had never seen the face a of a producer either, the person who would harvest the beans that he would receive in this workshop in Girona, nor did he know anything about the tiny amount of money they get from intermediaries. This journey is also a meeting point between the chocolate maker and the real life of cocoa producers. All this and much more is in the book, Casa Cacao, by Jordi Roca, written with the food journalist Ignacio Medina. 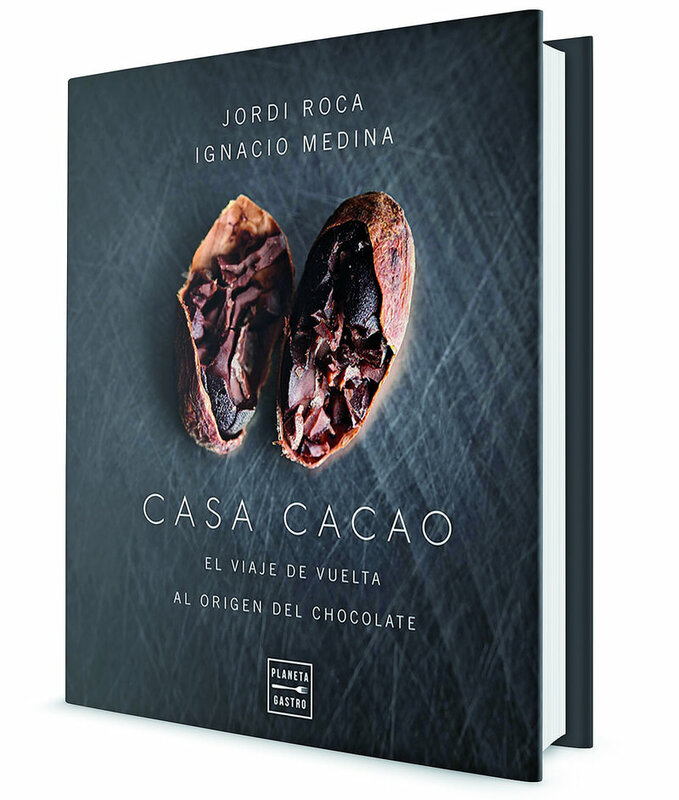 Casa Cacao, a journey back to the origin of chocolate, published by Planeta Gastro, is a large, luxurious volume that transmits the passion and enthusiasm Roca puts into his project, plus recipes. “There is no such thing as the best cacao in the world, in the same way there is no such thing as the best dish in the world. But what does exist is authentic people, and the fact that the cocoa plantations can generate more value,” said Roca at the presentation of the book in Madrid, adding that he decided to dedicate the author’s rights of the book to development programmes in these communities that produce the cocoa. Roca added that he plans to build a collecting and fermentation centre, to “improve the quality of cocoa”. “I have opened a Pandora’s box,” Jordi Roca admits, adding that he made the decision to buy directly from the producers in order to “give value to the cocoa in its origins and to those communities that produce it.” They are some of the emotions that will soon be translated into “extraordinary chocolate”, and which this year will be available for tasting as the Casa Cacao project gets underway in Girona. The new adventure of the Roca culinary family is called Casa Cacao, which will soon become a chocolate factory and a boutique hotel in the city of Girona. With the aim of making the best chocolate in the workshop of the Celler de can Roca restaurant, the challenge is bringing to term this project that will be centred on the concept of “from bean to bar”. Casa Cacao will be located in a building of the former Clinica Esperança, in Plaça Catalunya in Girona’s city centre. Chocolate will play the leading role, and the first floor will include a shop, chocolate bar, and the cocoa workshop. The chocolate that will be made live in front of the clients’ eyes will include a variety that will have no milk or dairy products or contain anything that is not cocoa, in order to “respect the authentic taste”. But there will also be others with goat or sheep milk, or the normal milk powder will be replaced by freeze-dried vegetables.